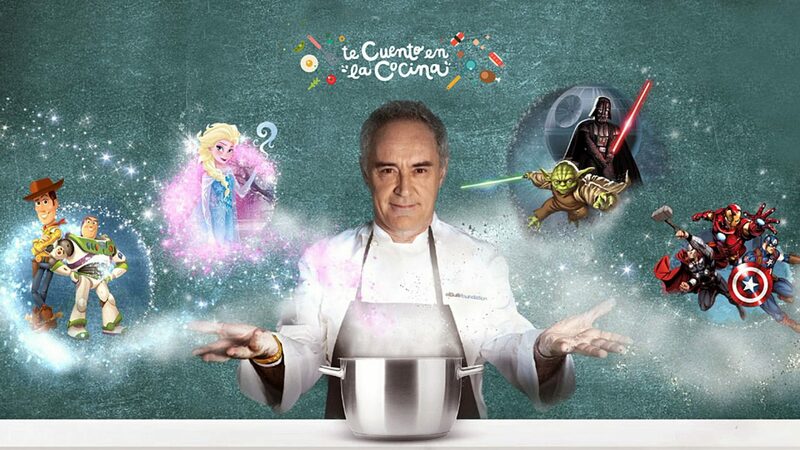 Inspired in healthy eating habits, Disney and chef Ferran Adriá have presented, “I’ll tell you it in the kitchen”, a book based on Disney characters, which will provide information on healthy eating and physical activity, in order to encourage parents and children to foster good nutrition in their homes, with a different format, full of fun and education. This project initially is promoted in Spain and Portugal, as a useful tool for feeding a fun filled educational aspect, to induce children to a healthy lifestyle. With more than 60 recipes in the book, the project will also include, “e-book” format , a website with “video-tricks”, TV spots that will be complemented in the future with the launch of a mobile application to secure their results and, to do, of what initially was a book, a more developed a tool. Every day more organizations are joining forces linked to its business areas, to encourage young and old in the benefits of opting for a healthy life. This results in a higher level of consciousness to process information linked to Diabetes (among other health problems related to food), and reduce the high incidence of overweight, obesity and Type 2 diabetes in children, caused by bad habits food that characterize the current lifestyle. Bad or good eating habits, no doubt, start at home. Here we find the basis of education when choosing the food we buy, how we cook, what we choose to eat when sharing a meal away from home and where we set limits and opt to give priority to our health. These initiatives understand the difficulty and importance that represent changes in our lifestyle, for that reason, creativity is an important aspect to develop options that capture the interest and achieve positive results with projects like this. Poor eating habits and physical inactivity, are primarily responsible for epidemics of overweight, obesity and Type 2 diabetes in children and young people, so in Diabetes Up To Date we celebrate with optimism, the launch of this extraordinary initiative of Walt Disney Company and the prestigious chef Ferran Adriá that seek to modify our lifestyle by promoting healthy eating habits for our children so they can enjoy a healthier, productive and happy life. If I have Gestational Diabetes… What can happen to my baby? Diabetes and Pregnancy… How can I tell if my baby is okay? If I have Gestational Diabetes… What should I do to make sure everything goes well? Will I need Insulin if I have Gestational Diabetes? Do you have Gestational Diabetes and are worried about the Insulin shots? If I had Diabetes during pregnancy… Can I breastfeed my baby? How should Diabetes be treated? How to prepare a simple dose of insulin? How to prepare a mixed dose of Insulin? How should insulin be injected? How do insulin pumps work? Who can use an Insulin Pump? What to do before using an Insulin Pump? What are oral hypoglycemic agents? Sugar, Glucose, and Carbohydrates, Enemies or members of Diabetes? What does Glycated Hemoglobin or Hemoglobin A1c mean? Besides people with Diabetes, Who else needs eye care? Why is it important to avoid foot infections when you have Diabetes? If you have Diabetes, How should you trim your nails, treat your calluses and have good foot hygiene? What is Hyperglycemia and how does it occur? Why is it important to avoid Diabetic Ketoacidosis? What are Chronic Complications in Diabetes? What is Hypertension or High Pressure and how does it occur? How do we know if we have Hypertension or high blood pressure and what causes it? What is Diabetic Retinopathy and the importance to prevent it? What are Diabetic Retinopathy treatments? What is and what happens when there’s Diabetic Nephropathy or Kidney Damage? What is Atherosclerosis and how does it originate? How do atherosclerotic plaques form and what happen if they progress? How to reduce the risk of Atherosclerosis? How does an erection occur and what happens when one has erectile dysfunction or impotence? What to do in case of Erectile Dysfunction or Impotence? How can we know if we have a normal weight? Metabolic syndrome… The road to Type 2 Diabetes? What does Insulin Sensitivity mean? How does Insulin Resistance occur? Metabolic syndrome… is this problem so serious? Type 2 Diabetes is a global epidemic… What can we do? Prediabetes… Precursor to Type 2 Diabetes? How can I know if I have Prediabetes? What are the risk factors of having Prediabetes? Congenital Hyperinsulinism… Watch your baby! What happens when there’s Hyperinsulinism or Hyperinsulinemia? What is Acanthosis Nigricans or Pigmentosa? Childhood obesity… What can we do to stop this situation? How to know if we have a normal body weight? Overweight or Obesity in Children? Why overweight is related to Diabetes? Why was the STOPP-T2D study done? What can I do if my child is overweight? What can you do if your child is overweight? Overweight in children… What to do when our children eat away from home? Adipocytes… Why does waist circumference increase so much? Waist circumference… How can I measure my risk? How do I know my BMI? What to do if there’s a certain degree of Insulin Resistance? What are the risk factors for developing Type 2 Diabetes? What to do if I’m at Risk of developing Type 2 Diabetes? How to decrease my risk of developing Type 2 Diabetes? How I can have a healthier life style and prevent the onset of Type 2 Diabetes? How to modify our lifestyle to prevent Diabetes? What can we do to prevent Cardiovascular Diseases in Children? How to acquire healthy eating habits? The information in Diabetes Up To Date is not intended to replace any medical treatment prescribed by your physician, nor to recommend any medical treatment: the only one indicated to do so is your physician. Diabetes Up To Date is an informative and educational guide that provide tools necessary to achieve good control of diabetes or its risk factors.